A hernia is a protrusion of the intestine through the muscle wall (typically in the region of the abdomen), creating a bulge in the skin. Hernias are more common than one may think, for males the lifetime risk is 27%. It can be painful or benign depending on the site in the body and size. The probability of complications is greatest in the early stage so seek a medical diagnosis at the earliest possible stage even if your hernia seems asymptomatic (benign). Hernias are classified as either single (unilateral) or double (bilateral) hernia. 54% will present to a doctor with a right-sided, 39.7% left-sided and 6.3% will be unlucky enough to have a bilateral hernia i.e. one either side of the groin. How is a hernia caused? Smokers cough or hard coughing generally. Lifting or pushing heavy loads. If you are aged 50+ and male you are more likely to have a hernia than the general population as a whole. This is due in part to the muscle wall becoming weaker as we get older and also a small gap in the muscle wall in males where the colon can protrude under stress, making males much more likely to encounter hernias than the female population. Hernias are also more common if you do heavy lifting or are a professional sportsman or woman where the body is under a high degree of physical stress. Neither a physically active nor sedentary lifestyle are contributing factors in themselves. The direct and indirect Inguinal hernias are the most common hernias affecting around 70-75% of all hernia patients affecting far more male patients who are predisposed to this type. A direct inguinal hernia pushes protrudes through the inguinal ring and typically the long-term failure of the inguinal ring to seal after the testicle passes through it. More common in older men. An indirect Inguinal hernia protrudes through a weak point in the fascia of the abdominal wall in approximately the same region. Epigastric hernias are relatively rare with just 1% of the hernia population. Generally classed as above the abdominal midline. At birth the umbilical cord leaves a weakness in the abdominal wall as the umbilical cord desiccates and disappears. A hernia can then protrude through this weakness. Affects up to 8% of all hernias. The hernia can be retained with a specialist hernia belt. An incisional hernia develops at the site of previous surgery where the muscle wall is already weaker or was previously cut. Friedrich et al recommend weight loss (where necessary) as the principal solution. 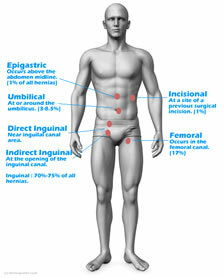 Incisional hernias are seen in just 1% of all hernia cases. Femoral hernias follow the femoral canal and account for 10% of all hernias. However, due to the smaller space through which the intestine protrudes they present a bigger risk to patient health as the colon has more chance of becoming strangulated and infected. 40% of femoral hernias present as emergencies. Unusually the incidence of femoral hernias is 4 times higher in women than men because a femoral hernia can be caused by pregnancy and childbirth. Reductible - The hernia can be compressed back into the body without undue strain or pain. Incarcerated - cannot be pushed back into the body without strain or pain. Endoscopic (keyhole) surgery - generally better outcomes although more expensive. Does not use a mesh. Open mesh repair surgery - more common, cheaper and straightforward but a growing selection of medical evidence that the post operative pain may have been underestimated. Watchful Waiting - For asymptomatic or minimally symptomatic hernia your doctor may recommend a period of 'watchful waiting'. During this period controlling the hernia together with diet additions can still have good outcomes. In several recent medical trials patient outcomes in terms of quality of life and pain thresholds were similar to patients that had surgery. Regime Change - In either case, your medical practitioner will probably advise a dietary and health-related regime change so that the hernia is not exacerbated. Around 30% of people with a unilateral hernia go on to develop a hernia on the other side so be careful! We recommend that our briefs are worn post-operation when the local area is completely healed and under the direction of your surgeon. (You do not need the foam pad insert).